Version 2.4 is our latest release. There are a number of command line tools that can help you troubleshoot various AtoM problems. See below for Common AtoM database queries. You can always find out what version of AtoM you have installed via the user interface by navigating to Admin > Settings > Global - the application version is the first thing listed on the Settings page. See: Application version for more information. The username should not have any spaces in it. This will create a superuser with username “demo”, email “demo@example.com”, and password “demo”. If you’d like to promote a user account in AtoM to have full administrator access privileges via the command-line, you can use the following task. You will need to know the user name of the account. The given user is already an administrator. The user <username> is now an administrator. If you need to change the password on a user account in AtoM, you can do so via the command-line. The username is a required value, while the password is optional - if no password is entered, AtoM will generate an 8-character temporary password to be used for the user account. AtoM will return the new password in the command-line. If the user account is currently marked inactive in the system (see Mark a user “Inactive” for more information), you can also use the option --activate to mark that account as active again. The --application, --env, and connection options should not be used - AtoM requires the uses of the pre-set defaults for symfony to be able to execute the task. The command, when run, will normally prompt you for comfirmation before proceeding. However, if you wish to skip the confirmation step, you can use the --force or -f option. To remove the user association with the notes so the task can proceed, you can use the --update-notes (or -n for short) option. When this is used, any notes associated with the user in the database will be updated so the user field is NULL, and the user account can now be deleted. Any notes created by the user will remain in the system, unaffected by the deletion. If you are upgrading to AtoM 2 from ICA-AtoM, the digital object derivatives (i.e. the reference display copy and the thumbnail generated by AtoM when a master digital object is uploaded) are set to be a different default size (i.e. they are larger in AtoM) - consequently, after an upgrade, derivatives from ICA-AtoM may appear blurry or pixellated. Alternatively, if you have changed the Digital object derivatives settings, you might want to regenerate your derivatives so that the new setting is used for multi-page content such as PDF derivatives. However, if you would like to re-index as the derivative regeneration progresses, the --index option can be used to enable this. For more information on populating the search index, see: Populate search index. However, experienced developers and system administrators can skip having to manually confirm the procedure by using the --force (or -f for short) option as part of the command. The --only-externals (or -o for short) option can be used if you would only like to attempt to regenerate the local derivatives for linked digital objects - that is, those that have been linked via an external URI, rather than by uploading a master digital object. For more information on linking digital objects, see: Link a single digital object to an archival description. The --json or -j option is for advanced users who would like to target only a specific subset of digital objects for regeneration. With this option, a user can supply the path to a JSON file that lists the internal digital_object ID’s associated with the digital objects targeted and stored in AtoM’s database. These digital_object ID’s will first need to be determined by crafting an SQL query designed to meet your specific criteria. Help crafting these queries is not covered here (though you can see below, Common AtoM database queries, for a BASIC introduction to SQL queries in AtoM) - in general, we only recommend this task be used by experienced administators. When running the regen-derivatives task, all of your current derivatives for the targeted digital objects will be deleted - meaning ALL of them if you provide no criteria such as a slug or a JSON file. They will be replaced with new derivatives after the task has finished running. If you have manually changed the thumbnail or reference display copy of a digital object via the user interface (see: Edit digital objects), these two will be replaced with digital object derivatives created from the master digital object. Finally, the --no-overwrite or -n option can be used if you only want to generate derivatives where they are currently missing. All existing derivatives will be left as-is in AtoM. When this option is used, no confirmation prompt is given: the task will begin generating missing derivatives as soon as you enter it in the console. In rare situations you may want to to re-index all PDFs to make their text searchable in AtoM without having to re-import them completely. This task will go through each existing PDF imported into AtoM and re-index their contents for searches. For linked digital objects (e.g. PDFs that are linked from a publicly accessible URI, instead of uploaded locally - see for example: Link a single digital object to an archival description), this task will re-fetch a version of the external PDF and store it in a temporary file, re-index the contents, and then purge the local master after the indexing is complete. AtoM generally uses a relational database to store its data (we recommend MySQL). However, relational databases, which are comprised of flat tables, are not particularly suited to handling hierarchical data. As developer Mike Hillyer notes, “Hierarchical data has a parent-child relationship that is not naturally represented in a relational database table.” One method of addressing this is to employ a “Nested set model” (Wikipedia). AtoM makes use of a nested set to manage hierarchical relationships, such as between parent and child terms and descriptions. In some cases, AtoM may time out in the middle of an operation that involves the creation of new records - for example, if a user attempts to import a very large CSV file through the user interface (rather than the command-line - see: CSV import). In such cases, it is possible that AtoM has died after creating an information object, but before having a chance to create a slug for the record. This can cause unexpected errors in the application - most notably, 500 errors when trying to access the records missing slugs through the application interface. If an error has left other areas in AtoM without slugs (for example, a donor record, etc), this task will not resolve the issue - you will likely have to manually insert a slug into the database for that entity. For information objects, the generate slugs task will respect the global settings for the source from which description permalinks are created. These settings can be controlled by an administrator via the user interface - for more information, see: Generate description permalinks from. Note that by default, existing slugs will not be replaced. If you want to generate new slugs for existing objects, you will need to first delete the existing slugs from the database. This can be useful for records in which a random slug has been automatically assigned, because the default user data used to generate the slug has not been provided (see below for more information on how slugs are generated in AtoM). Slugs can also be manually deleted via SQL queries. For further information on deleting slugs from AtoM’s database via SQL, see below in the section on Common AtoM database queries - particularly, Delete slugs from AtoM. A slug is a word or sequence of words which make up the last part of a URL in AtoM. It is the part of the URL that uniquely identifies the resource and often is indicative of the name or title of the page (e.g. : in www.yourwebpage.com/about, the slug is about). The slug is meant to provide a unique, human-readable, permanent link to a resource. Generated slugs will only allow digits, letters, and dashes. Sequences of unaccepted characters (e.g. accented or special characters, etc.) are replaced with valid characters such as English alphabet equivalents or dashes. This conforms to general practice around slug creation - for example, it is “common practice to make the slug all lowercase, accented characters are usually replaced by letters from the English alphabet, punctuation marks are generally removed, and long page titles should also be truncated to keep the final URL to a reasonable length” (Wikipedia). In AtoM, slugs are truncated to a maximum of 250 characters. If a slug is already in use, AtoM will append a dash and an incremental number (a numeric suffix) to the new slug - for example, if the slug “correspondence” is already in use, the next record with a title of “Correspondence” will receive the slug “correspondence-2”. If a record is created without data in the field from which the slug is normally derived (e.g. an archival description created without a title), AtoM will assign it a randomly generated alpha-numeric slug. Once assigned, slugs for archival descriptions can be changed through the user interface. Slugs for other entity types cannot be changed through the user interface - either the record must be deleted and a new record created, or you must manipulate the database directly. Finally, static pages, or permanent links, include a slug field option, but only slugs for new static pages can be edited by users; the slugs for the default Home page and About page in AtoM cannot be edited. New static page slugs can either be customized by users or automatically generated by AtoM if the field is left blank; AtoM will automatically generate a slug that is based on the “Title” you have indicated for the new static page. For more information on static pages in AtoM, see: Manage static pages. Slugs such as “search” and “browse” are reserved for use in AtoM by the Search and Browse modules - if you create a static page, or even a description, with the slug “search”, it may interfere with your search results, redirecting to this new page instead of display your results! A simple workaround would be to iterate the slug (e.g. “search-1”) or alter it in some meaningful way (e.g. for a static page with tips on searching, changing the slug to “search-help”). A command-line tool will run through taxonomy terms, consolidating duplicate terms. If you’ve got two terms named “Vancouver” in the “Places” taxonomy, for example, it will update term references to point to one of the terms and will delete the others. 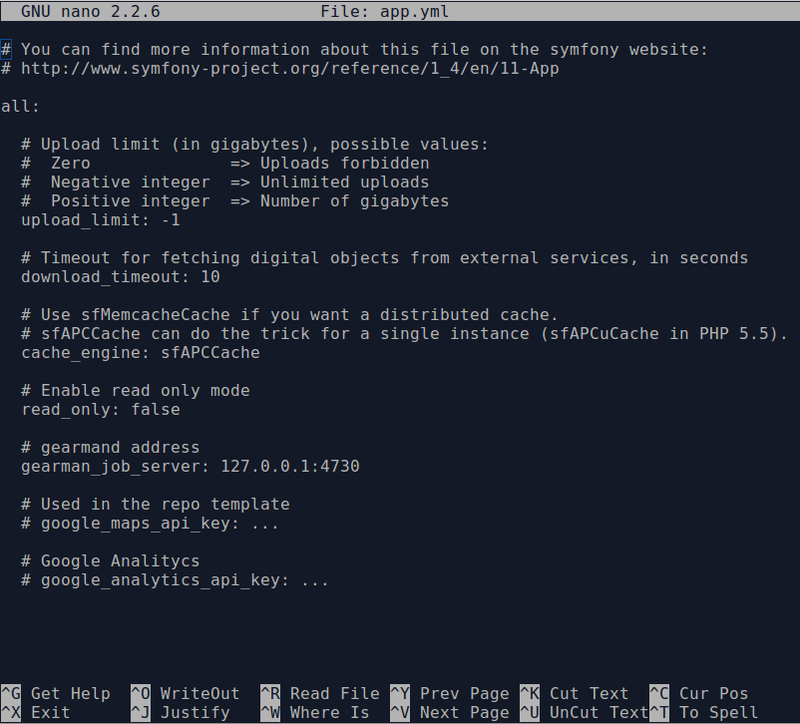 By entering php symfony help taxonomy:normalize into the command-line, you see the options and descriptions available on this tool, as pictured above. The --application, --env, and connection options should not be used - AtoM requires the uses of the pre-set defaults for symfony to be able to execute the import. The --culture option on this command-line tool is optional - the default value, if none is entered is en (English). The value you enter for <culture> should be the default culture of the terms you wish to normalize - in most cases this will be the default culture you set up when installing AtoM (though depending on your imports and multi-lingual use of the application, this may not always be true) The value, if needed, should be entered using two-letter ISO 639-1 language code values - for example, “en” for English; “fr” for French, “it” for Italian, etc. See Wikipedia for a full list of ISO 639-1 language codes. The taxonomy name value should be entered as it is seen in the user interface in Manage > Taxonomies. This value is case sensitive. If the taxonomy name has spaces (i.e. if it is more than one word), you will want to use quotation marks. php symfony taxonomy:normalize --culture="fr" "Physical object type"
In AtoM, an archival description can have publication status of either “Draft” or “Published”. The publication status of a record, which can be set to either draft or published, determines whether or not the associated description is visible to unauthenticated (i.e., not logged in) users, such as researchers. It can be changed via the user interface in the administration area of a description’s edit page by a user with edit permissions. See Publish an archival description for instructions on changing this via the user interface. If you would like to change the publication status of a record via the command-line, you can use the following command-line tool, run from the root directory of AtoM. You will need to know the slug of the description whose publication status you wish to update. AtoM requires two parameters to be able to execute the task: the publication status you wish to use, and the slug of a resource on which to perform the task. For the publication status, you can use any term you have added to the Publication status taxonomy in AtoM - the default terms are Draft, and Published. You cannot create a new publication status term by using this task - the term must already exist in AtoM, or the task will fail. By entering php symfony help tools:update-publication-status into the command-line, you see the options available on this tool, as pictured above. In general and as in the user interface, if a parent description is updated, it will also update the publication status of its children. In some rare cases however, there may be legacy records in the system with a publication status of NULL. The command-line option --force, or -f for short, will force the update of the target information object and all of its children, including legacy records that might have a publication status of NULL. We recommend using this option any time you want a publication status update to affect children as well. The --ignore-descendents, or -i, option can be used to leave the publication status of all children unchanged. This is useful if you have a mixture of publication statuses at lower levels - some draft, and some published. Normally when the command is run, AtoM will ask for a y/N confirmation before proceeding. The --no-confirm or -y option was introduced so that developers who are interested in using this task in a larger scripted action can override the confirmation step. If the --repo or -r option is used, AtoM will update the publication status for ALL descriptions belonging to the associated repository (i.e. archival institution). To use this option, you must supply the slug of the repository. Example use - updating all the descriptions associated with “My archival institution” (slug = my-archival-institution) to published. As the task proceeds, it will print a . period in the command-line for each record that is updated, providing a visual indication of progress. You can delete a description from the command-line if you know the description’s slug. A slug is a word or sequence of words which make up a part of a URL that identifies a page in AtoM. It is the part of the URL located at the end of the URL path and often is indicative of the name or title of the page (e.g. : in www.youratom.com/this-description, the slug is this-description). When a new information object is created in AtoM, the slug for that page is generated based on the title, with spaces, stopwords, and special characters stripped out. Are you SURE you want to do this (y/n)? Enter “y” if you are certain you would like to delete all draft records. AtoM includes several options for exporting archival description metadata in XML format - for more information, see: Export XML. Additionally, users can enable the OAI plugin to allow harvesters to collect archival description metadata via the OAI-PMH protocol, in EAD 2002 or Dublin Core XML - for more information, see: OAI Repository. Normally, when exporting or exposing archival description metadata, the XML is generated synchronously - that is, on request via the web browser. However, many web browsers have a built-in timeout limit of approximately 1 minute, to prevent long-running tasks and requests from exhausting system resources. Because of this, attempts to export or harvest EAD 2002 XML for large descriptive hierarchies can fail, as the browser times out before the document can be fully generated and served to the end user. To avoid this, AtoM includes a setting that allows users to pre-generate XML exports via AtoM’s job scheduler, and then cache them in the downloads directory. This way, when users attempt to download large XML files, they can be served directly, instead of having to generate before the browser timeout limit is reached. For more information, see: Cache description XML exports upon creation/modification. The XML generated will be cached in AtoM’s downloads directory - 2 subdirectories named ead and dc will automatically be created, and the XML will be stored by type in these two subdirectories. When users attempt to download XML from the view page of an archival description, AtoM will check if there is a cached copy of the requested XML and if so, it will serve it. If there is no cached version available, then AtoM will fall back to the default behavior of generating the XML on request. In an OAI-PMH request, if a cached version of the EAD 2002 XML is available, AtoM will serve it in response to oai_ead requests - if there is not a cached version, then AtoM will return a “Metadata format unavailable” reponse. In contrast, if no cached DC XML exists, the OAI Repository module will generate DC XML on the fly to respond to the request. For further information, see: OAI Repository. By default, cached XML files are generated for public users, meaning that draft descriptions are not included in the XML. When engaged, this setting will not retroactively generate and cache XML for existing descriptions. Howeveer, this command-line task can be used to generate and cache EAD 2002 and DC XML for all existing descriptions. In some cases with very large hierarchies (for example, an archival unit with thousands or tens of thousands of descendants), available system memory may be exhausted during this process, and the task may crash before all XML can be generated. In that case, the --skip option can be useful for restarting the task exactly where it left off. By default, cached XML files are generated for public users, meaning that draft descriptions are not included in the XML, and cached XML is not generated for any unpublished archival units. Other entities in AtoM (such as accessions, user and goup records, terms, etc.) will not be affected. Links, including email mailto: links, will be replaced with AtoM’s custom formatting for links - for more information, see: Add custom hyperlinks to text fields. This means that after being run, links will now appear in AtoM’s view pages as they were intended to when the HTML was added. Styling elements, such as <em>, <b>, <strong>, <i>, etc. will be removed with no substitutions (the text they wrap will be preserved). Definition list elements such as <dd>, <dt>, etc (which were briefly used in earlier versions of AtoM to structure physical description EAD import data) will be removed (the text they wrap will be preserved). This task is useful when performing an administrative review of your AtoM installation. If you have imported a large controlled vocabulary to one of AtoM’s taxonomies (such as subject, place, or genre access point terms), you might want to be able to determine which terms are actually in use (i.e. linked to descriptions) versus those which are currently not linked to any descriptions. This task, when run against a specific taxonomy, will generate a CSV with a list of terms that are linked to one or more archival descriptions (information objects). 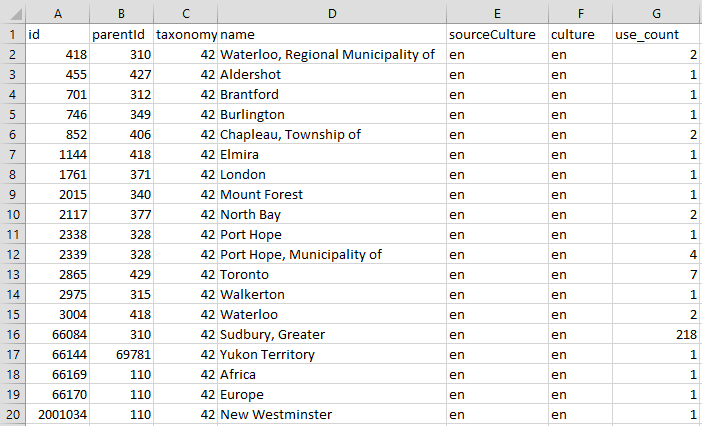 The CSV includes a count of how many times a specific term is used (e.g. a count of direct links to information objects - inherited links from a hierarchy are not counted). It does not list terms that are in the taxonomy but currently not used. parentId: the object ID of the the parent to which the term is linked. Even in a taxonomy that is not organized hierarchically, terms are linked to a root term object. If the terms are organized heirarchically, then the parentID value will be the objectID of the parent term. taxonomy: the ID of the taxonomy to which the terms belong. In AtoM, typically the Subjects taxonomy ID is 35; Places is 42, etc. use_count: a simple count of the number of times the term has been directly linked to an information object (archival description). Inherited relationships are not counted - e.g. in a hierarchy of Canada > Ontario > Toronto, when Toronto is linked to an information object, Canada and Ontario do not also receive a count. You must specify a target destination for the export as a file path, including the name of the csv, and ending in the .csv extension, for the command to work as expected. See the examples below. The --application, --env, and connection options should not be used - AtoM requires the uses of the pre-set defaults for symfony to be able to execute the export. The --items-until-update option accepts a whole integer value, and will indicate the progress of the task every n items by printing a dot in the console. you can use either the --taxonomy-name or the --taxonomy-id options to tell the command which taxonomy terms you wish to count in the resulting CSV. By default, the --taxonomy-name option expects the English name of the target taxonomy; however, you can use the --taxonomy-name-culture option to give the name of a taxonomy in another culture - this option expects a 2-letter ISO language code (e.g. “en”, “fr”, “es”, etc) as its value. The --taxonomy-id option expects as its value the internal ID of the target taxonomy. Below is a list of some of the more commonly used taxonomies in AtoM, and their IDs. This list is NOT comprehensive - to see the full list, navigate to /lib/model/QubitTaxonomy.php, or see a full list in AtoM’s code on GitHub here. However, you can also attempt to automatically populate existing latitude and longitude fields, based on previously entered Contact area address data (e.g. street address, city, region, postal or zip code, country, etc). AtoM will begin reviewing all available repository contact information, and where possible, it will populate the latitude and longitude fields based on the address data. If any issues are encountered (such as incorrect or insufficient contact information for a lookup), the console will print an error message and move on to the next repository for lookup. The tool will prompt you for the title and description of your site as well as for details needed to create a new admin user. If a .gitconfig file is present in your home directory purge will use your name and email, from that file, to provide default values. It will add a site title to the installation - “Demo site”. It will NOT clear the application cache. We recommend clearing the cache and restarting all services after running this task - e.g. See Manage user accounts and user groups for information on how to edit or delete the demo user account via the user interface. See: Site information for instructions on how to edit the site title via the user interface. See Clear cache for more information on clearing the cache. The database is now restored to the point when you dumped it. Sitemaps are an easy way for webmasters to inform search engines about pages on their sites that are available for crawling. In its simplest form, a Sitemap is an XML file that lists URLs for a site along with additional metadata about each URL (when it was last updated, how often it usually changes, and how important it is, relative to other URLs in the site) so that search engines can more intelligently crawl the site. Web crawlers usually discover pages from links within the site and from other sites. Sitemaps supplement this data to allow crawlers that support Sitemaps to pick up all URLs in the Sitemap and learn about those URLs using the associated metadata. Using the Sitemap protocol does not guarantee that web pages are included in search engines, but provides hints for web crawlers to do a better job of crawling your site. This XML sitemap can then be passed to search index providers such as Google, for better indexing of your AtoM instance. Multiple sitemaps can be generated by the task to account for Google’s limits on size and/or number of nodes. If the sitemap file has more than 50,000 nodes, it will automatically be broken into multiple sitemaps. If a user adds a custom level of description to the Level of description taxonomy (see: Terms), or if you wish to change the default priorities, you can edit the sitemap.yml file found in the config directory. see: config/sitemap.yml for more information. There is currently no way to add custom weights for other entities in AtoM such as authority records, archival institutions, functions, or static pages, etc. The default weighting for new archival description levels of description added, without a custom entry into the config/sitemap.yml file is 0.9. By default, authority records receive a weight of 0.5 and static pages a weight of 1.0. When the command is run, at least 2 files are generated - by default they are added to the root AtoM directory (though a specific location can be specified using the task’s options - see below). A sitemap.xml file acts as a pointer file when multiple sitemaps are produced (e.g. if there are more than 50,000 nodes, the task will automatically break this up into 2 or more XML files, as per Google’s recommendations). If only 1 sitemap file is produced, this pointer will still be generated, but will not be needed and can be discarded if desired. The other file (or files) is the actual sitemap for your AtoM instance - by default it is compressed using Gzip, although again there is also an option to disable this if desired. By typing php symfony help tools:sitemap into the command-line, you can see the options available on the export:bulk command, as pictured above. the --output-directory (or -O for short) option is used to specify a specific location for the sitemap XML files on output - by default, they are added to AtoM’s root directory. The --base-url option can be used to specify a base URL for the AtoM instance, used in the sitmap XML files generated. Note that AtoM will use the value entered in the Admin > Settings > Site information page for the Base URL by default, so if you’ve added the correct value there, you shouldn’t need this option. See: Site information for more on Base URLs. Also by default, the XML sitemap generated will be compressed using Gzip - however, if desired, you can prevent the compression by using the --no-compress option. If an older sitemap already exists in the target directory when the task is run, AtoM will ask you to confirm if you want the older versions to be overwritten or not. If you don’t want this interruption (e.g. if you are using this task as part of an automated deployment, etc), you can skip the confirmation step with --no-confirmation, or -B for short. Finally, if you would like the sitemap(s) to be submitted to Bing and Google after generation, you can add the --ping option to the command. While a workflow that will automatically upload DIPs from Archivematica to AtoM is supported (see the links above), there may be cases where an archivist chooses to store a DIP, and then wishes to upload it later without having to run it through the re-ingest process. In that case, a system administrator can use this task to manually attach DIP objects to existing archival descriptions in AtoM. Additionally, the object names without the UUID must be unique for the upload to succeed. If you have a number of files with the same name, we suggest appending an incrementing number (e.g. correspondence-01, correspondence-02, etc). For AtoM to know where to upload the objects, you will also need to prepare a simple CSV file. The CSV can be named anything, but must have the extension .csv for the upload to work. The CSV must include a filename column, which specifies the full name of each object. Additionally, include either an identifier column (if your identifier values in AtoM are unique) or, preferrably, a slug column, so AtoM knows the description to which each object will be attached. Do not include both an identifier and a slug column in your CSV, or the upload may fail. You must choose one or the other - the final CSV should only have 2 columns. As a parameter, the task requires a file path. The path should point to the top-level directory where you have added the DIP. The --undo-log-dir option can be used to log which information objects (aka descriptions) have digital objects added to them as a result of running the task. This log can be used, in event of an incomplete import, to either establish where the import stopped or to manually remove the imported digital objects. Undo logs contain two columns: the object ID of the information object to which objects have beem imported, and the DIP directory from which the objects were imported. For more information on using the object ID, you might want to review the section below, Common AtoM database queries. Similarly, the --audit option can be used to verify that all objects specified in the CSV file were imported. 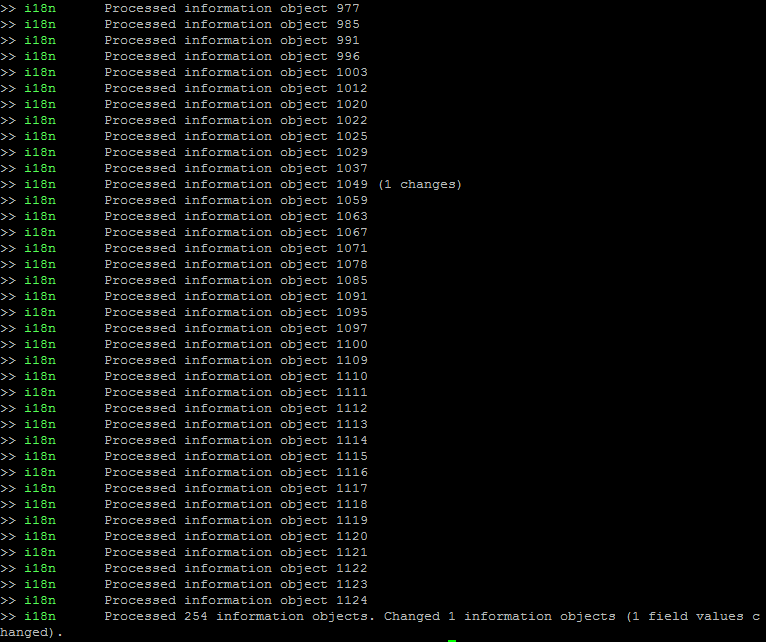 If any are found to be missing, then the object’s filename will be output in the console. Occasionally manually modifying the AtoM database is required, such as when data gets corrupted from timeouts or other bugs. Here we will include a few useful queries based on common actions users wish to perform on their databases, which are not accommodated from the user interface. For all of these, you will need to execute them from inside MySQL, using the username and password you created during installation. Once you’ve accessed the database, you can run SQL queries to manually modify the AtoM database. We strongly recommend that you back-up all of your data prior to manipulating the database! If possible, you should test the outcome on a cloned development instance of AtoM, rather than performing these actions on a production site without testing them in advance. Don’t forget to rebuild the search index! This command will truncate all slugs to a specified maximum character length. In the example below, the character length is 245. In some cases, you may wish to replace the existing slugs in AtoM - particularly if they have been randomly generated because the user-supplied data from which the slug is normally derived (e.g. the “Title” field for an archival description) was not entered when the record was created. For more information on how slugs are generated by AtoM, see above, Notes on slugs in AtoM. If you have since supplied the relevant information (e.g. added a title to your archival description), you may want to generate a new slug for it that is more meaningful. Remember, you will run into problems if you don’t replace the slug! You can use the generate-slug task to do so; see Generate slugs, above. Remember as well: if you are trying to replace a randomnly generated slug, but you haven’t filled in the data field from which the slug is normally derived prior to deleting the old slug (see above for more on how slugs are generated in AtoM), you will end up with another randomly generated slug! Make sure you back up your data before proceeding! See: Backing up the database. 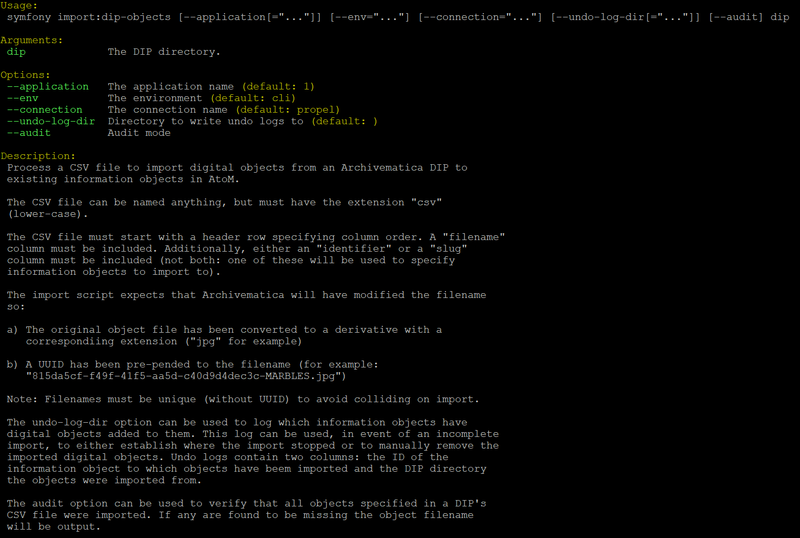 See above for further documentation on this command-line tool. This is an extreme action, and it will delete ALL slugs, including custom slugs for your static pages - and may break your application. The generate-slugs task will not replace fixtures slugs - e.g. those that come installed with AtoM, such as for settings pages, browse pages, menus, etc - or any static pages! We strongly recommend backing up your database before attempting this - see above, Backing up the database - and we recommend using SQL queries to selectively delete slugs! Open the general index or type your search in the search box.